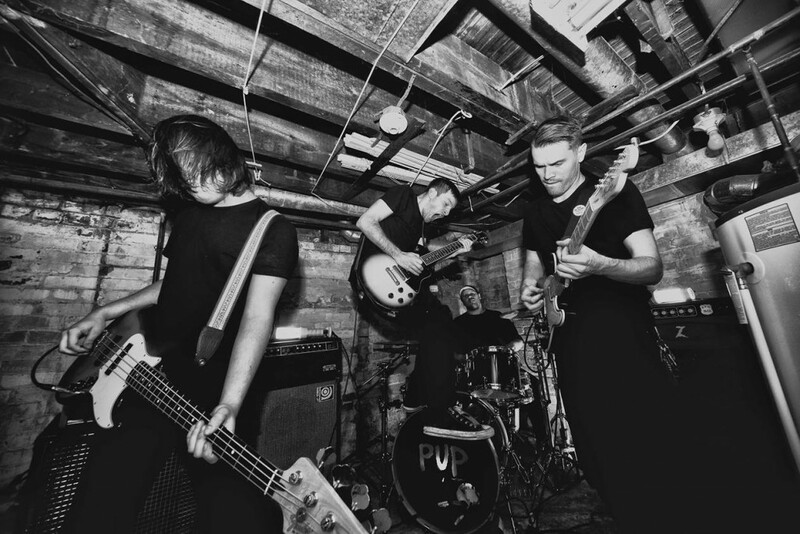 The last time that The MusicNerd Chronicles connected with Toronto punk-inspired band PUP was the fall of 2013, a time when the then two-year old group was celebrating the fresh release of their self-titled debut album. Expectations for the band were running high. Their album had earned almost unanimous praise from influential media outlets including Stereogum, Toronto’s NOW Magazine, NME in the U.K., Brooklyn Vegan and Audio Addict. While the group couldn’t have been happier with the praise being thrown their way, PUP vocalist Stefan Babcock said the group was also taking a realistic approach to things, refusing to let anything go to their heads. He reflects upon that statement almost two years later as PUP prepares to headline Sackville’s Sappyfest on Friday July 31. He remains as even-keeled as he was during his first interview with the paper, but with an added sense of amazement at all that has transpired for the group over the course of the last 24 months. Babcock and his PUP band mates – drummer Zack Mykula, bassist Nestor Chumak and guitarist Steve Sladkowski – certainly got what they wished for, estimating the group played well over 200 shows in 2014 alone. Babcock says the group more than likely spent no more than three weeks of the year in their hometown of Toronto. Not that he is complaining in the least. While being on the road can pose its share of challenges, from questionable meals to living with a number of other individuals on a near-constant basis, Babcock says much of the group’s desire to remain on tour could be attributed to the ever-growing audiences that were coming out to see them perform. “Touring isn’t a piece of cake. We love each other and love spending time together, but it can also be challenging when you’re missing family or friends at home. With promotional duties behind their debut record nearing their completion, Babcock says the group isn’t about to embark on an open-ended vacation once their Sappyfest performance in behind them. Finding that writing new material while on tour didn’t necessarily work as well for them as it does for some artists, Babcock says the group spent six days a week in their Toronto rehearsal space in effort to write new material. Over the span of approximately two months earlier this year, PUP amassed a collection of 14 new songs, which they will bring to the table for the making of their sophomore record later this year. For all of PUP’s world travels, however, Babcock isn’t shy about concealing his delight at the group’s imminent return to Atlantic Canada, expressing humility at the very notion that his group has been given the honour of being a headliner at a festival like SappyFest. “Despite the immense amount of touring we did in 2014, we never made it to the East Coast. We had such a great time when we played there in 2013, but the album was new and I don’t feel like we had the chance to really put our best foot forward,” Babcock says. When: Friday July 31, 7 p.m.